Despite the freezing temperatures many were blessed! 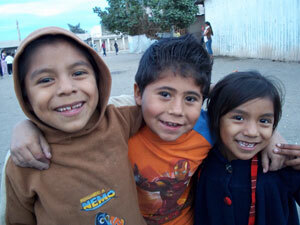 Each year the Culiacan Project is different, and this year was the year it froze. On Thursday of the first week of the outreach the temperature got down to 30 degrees, freezing most of the crops planted in the agricultural zone north and south of Culiacan. Besides damaging the crops, the bitter cold made it very hard for the migrant workers to stay out in the open watching the Jesus film and receiving prayer. During the second week, after the freeze, we saw that the camp managers were sending people home on the buses because there were no crops left to pick. These precious souls were going home having lost their year's income and without having heard that God loves them. We decided not to continue with our one camp a day schedule and go to as many camps as we could while some workers were still in the valley. There was urgency in our hearts as we hurried the teams out to visit multiple camps each day. We gave out CDs, New Testaments, calendars in Indian languages, and other material. 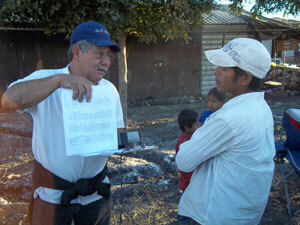 By the end of the project 12,600 CDs had been given out, in more than 120 languages and dialects! We thank God for the thousands of people who braved the cold weather to watch the films at night and stay for prayer for their families. Over 3,600 names were written down of those who made a decision for Christ. Even as we huddled and shivered in the camps, the angels of God rejoiced in heaven over the wonderful harvest of souls that entered His kingdom this year in Culiacan. 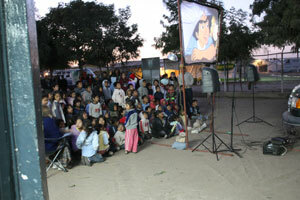 Despite the freezing temperatures many were blessed!